So now we are back in another phase of sharply rising global food prices, which is wreaking further devastation on populations in developing countries that have already been ravaged for several years of rising prices and falling employment chances. The food price index of the FAO in December 2010 surpassed its previous peak of June 2008, the month that is still thought of as the extreme peak of the world food crisis. Some of the biggest increases have come in the prices of sugar and edible oils. The US import price of sugar doubled over the second half of 2010. Traded prices of edible oils like soya bean oil and palm oil increased by an average of 50 per cent over the same period. But even staple prices have shown sharp increases, with the biggest increase in wheat prices, which went up by 95 per cent between June and December 2010. Rice prices have been relatively stable in global trade over the past year in comparison, but in fact the FAO reports that domestic rice prices in major rice producing and consuming countries, especially in Asia, continued to increase and are now at their highest ever levels. No one can claim that we could not see this coming. 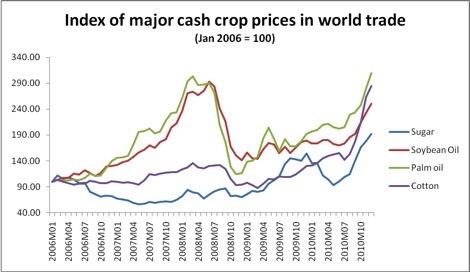 In fact, ever since the severe price crunch of mid 2008, there have been those who argued that unless major changes were made both in national policies towards agriculture and the way in which we manage the global trade in both agricultural commodities and their futures markets, such a repeat would be almost inevitable. But the world is a curious place nowadays, with public memory so short as to be almost non-existent and media analysis (as well as public policy) still dominated by those who have comprehensively messed it up but have no sense of either shame or rectitude. So the same tired old reasons for the current food price increase are being trotted out once again, even though they were completely wrong two years ago and are wrong again today. Wrong reason number 1: Global food prices are increasing because of increased demand from developing countries, especially the rapidly growing large populations of China and India. In fact, FAO data tell the real story, which is quite the opposite. The total consumption of major food grain increased only slightly in the world as a whole (less than 2 per cent) and for several crops it even fell. 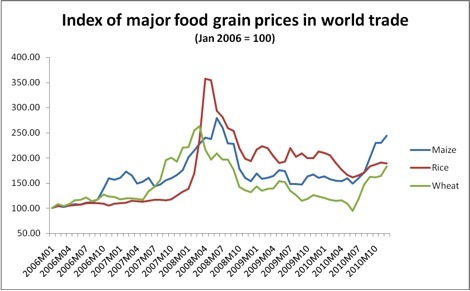 The total amount of food grain traded in global markets has actually fallen. Consider the case of wheat, which has seen such a dramatic increase in price over the past year. Total global “utilisation”, or consumption, is estimated to have increased by only 1.2 per cent over the previous year. But global wheat production fell, quite sharply, by 4.3 per cent, so it is the supply shortfall that affected prices. Of course, even this real imbalance is not enough to explain the significant price shift – but more on that later. In annual terms, the really big increase has come in maize (or corn) prices. The US f.o.b. corn export price increased by around 53 per cent in the year to December 2010. But global utilization of all coarse grains (in which corn dominates) increased by only 1.8 per cent. The problem for corn was that production fell by 1.1 per cent, and the effects of La Nina and other weather-related phenomena suggest that there may be further adverse effects on supply. In early January the US government cut its forecast for corn stocks by as much as 30 per cent, creating a new and even more intense spiral in corn prices. And of course corn use is significantly affected by the obscene subsidies that are still provided for biofuels. Last year these subsidies – which ironically are not even really “green” – meant record ethanol production that accounted for nearly 40 per cent of US corn production. Clearly, therefore, the recent problem relates much more to supply than to demand – and that too, supply from the major large exporters among developed countries. Production in most developing regions was actually significantly higher in 2010 than it was in the previous year, and indeed has generally kept pace with utilisation in some developing countries. But various weather and other shocks have meant that large exporters have seen their production and exports drop, thereby affecting global markets. So does that mean that supply shocks have caused the recent problem? Certainly to a significant extent – and that brings back the crucial issues of reviving agriculture and making it more viable, especially for small cultivators in the developing world. But it cannot explain the entire increase. And that raises the second common – and wrong – reason that is presented for the current price hike. Wrong reason number 2: The price hike is entirely because of real demand and supply imbalances. This is simply not possible given the volatility and sharp movements of prices that can be seen from the charts. Once again, it is likely that a combination of panic buying and speculative financial activity is playing a role in driving world food prices up well beyond anything that is warranted by real quantity movements. The most recent data on financial activity in commodity futures markets from the US Commodity Future Trading Commission suggest that until the end of November the net long positions of index investors had increased dramatically in commodities like wheat and corn. This is likely to have increased even more in the past few weeks, given the announcements about lower levels of public stocks. Similar trends are evident in the petroleum market, which has driven oil prices up to around $100 a barrel. Higher oil prices also feed into higher food prices, creating another source of price spiral. Once again we are also seeing contango in these commodity markets, with futures prices higher than spot prices. This is all a repeat of 2007 and the first half of 2008, when prices of these commodities nearly tripled. And it is not surprising, because the regulations that could prevent or at least limit such speculative financial activity are not yet in place, and there are even concerns about whether they will be effective or toothless in the implementation. But is such regulation a case of shooting the messenger? No, because we have direct recent experience of how financial speculation in commodity markets can create not only unprecedented volatility, but also affect prices in developing countries with extreme effects on hunger and nutrition for at least half of humanity. The case for moving swiftly to ensure effective regulation in this area – and for dealing with supply issues in a serious and sustainable way – has never been more compelling. Your argument seems flawed, as you leave out a crucial piece of detail: that demand (for food in particular) is very inelastic – i.e. price has to move up a lot before demand is reduced to match available supply. could the reason be that index investors covers the increased demand for hedging? If not, then who is on the other side of the deal? it is the problem in production that causes the increase in price because it could no longer meet the demand.